It was a typical Monday like you would expect it. I got word that the Managed Metadata Service is not working correctly. 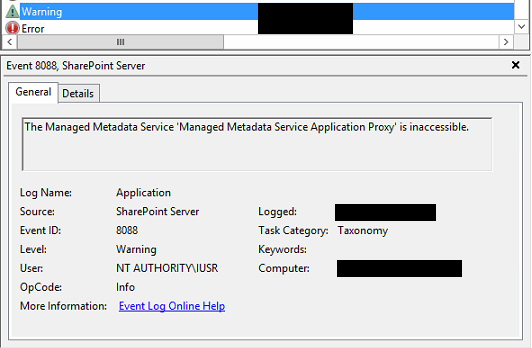 The Managed Metadata Service Application Proxy is inaccessible. I got this beautiful message when I tried to manage my Managed Metadata Service Application. I’m sure most of you are familiar with this message. So I started digging the logs for an explanation. The Managed Metadata Service ‘Managed Metadata Service Application Proxy’ is inaccessible. Failed to get term store for proxy 'Managed Metadata Service Application'. … The given key was not present in the dictionary. I haven’t seen this one before. … and I found everthing in perfect condition. A new challenge asks for a new solution. I created a totally new Managed Metadata Service Application just to prove that the configuration is correct and it worked perfectly fine like expected. Now I was sure that there must be a problem with the old ApplicationPool or the Managed Metadata Service Database! Because of the error message I was pretty sure that there was a problem with the ApplicationPool. To prove my theory and to get my Managed Metadata Service Application back to work, I recreated it with this script. $meta = New-SPMetadataServiceApplication -Name "Managed Metadata Service Application" -ApplicationPool "Managed Metadata Service Application Pool" -DatabaseName "[Old Metadata DB Name]"
If the old ApplicationPool was dedicated to the old Managed Metadata Service Application you should delete it. You can use this script to do so. $metaapppool = Get-SPServiceApplicationPool -Identity "[ApplicationPool Name]"
I still don’t know how or why this happened, so I would appreciate your hints and ideas.